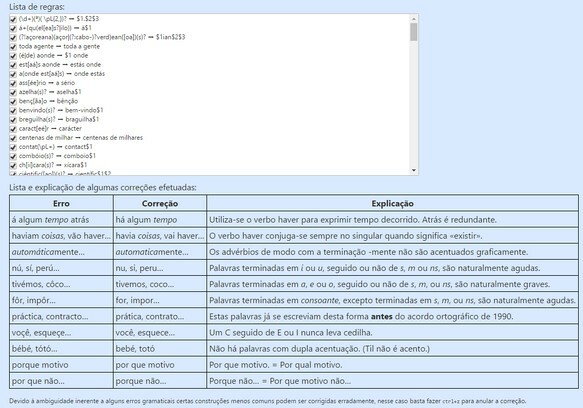 This extension will automatically correct common spelling and grammar mistakes in Portuguese as you type! - Corrects common spelling and grammar mistakes, accentuation and capitalisation as you write. - You can undo a correction with ctrl+z. - Disable in certain sites. - European and Brazilian Portuguese, before and after orthographic reform. the are 2 reaction to the GrammarNazi termin. People who know that mem and lulz about it. And people who react like oldfagz butthurting around it. I am deeply touched and would be very glad to get the names of people involved in letting such a hate word like nazi for a utility tool, not to mention the logo, symbol of hate, one of the nazi-youth flag is very similar. You people make me sick and me and many other persons remain mute and very shocked by such a mentality. NAZI, is the contraction of 2 German words: NAtional-soZIalismus. You might have an excuse as you leave in a country far away, not like us in Europe. But don't you think you have enough racial violent issues around your country. Nationalism mixed mind-buried racism will create an explosive asset. But sadly, not dangerous enough for your conscience. Some people just take it too seriously. "Nazi" because it's something that is ruthlessly controlling you - or your spelling really.